This flow is only for giving access to an existing User to a Product. If you wish to add a new user manually to the system, then see this post. Go to the Users > Manage screen. They’re initially added as a “Free” user by default. You may mark them as “PAID” if you want to have access to the product just like an actual paying member would. (OR) How does someone become a member? With DAP, you can add users to your membership site in 3 different ways. All three are explained in detail below. *You first create a “Sales Page”. On your sales page, depending on which payment processor you use, you go to Paypal/1ShoppingCart/ClickBank and create a new product with the EXACT same name as the product you created within DAP, and get the ‘Buy Button’ link from your Payment Processor. Publish this “Buy Button” on your sales page. * Your payment process (Paypal/1ShoppingCart/ClickBank) notifies DAP that you have a new purchase. * If the product names match, DAP automatically creates an account for them, generates a random password, and sends them an email with their email/password. 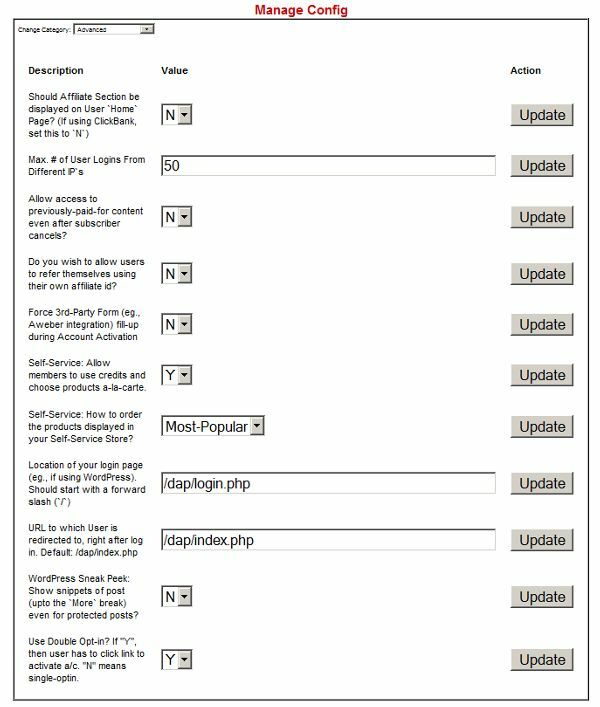 You can customize the contents of this email on the “Templates” screen in your DAP Admin Control Panel. Integration with your shopping cart explained elsewhere (see documentation for setup). That’s how “buyers” get added to your membership site and get access to the product they just purchased. You wish to give someone a “Free” membership. NOTE: “Free” members who do not have a payment associated in DAP (which means they have not purchased anything) will have access only to content that you have marked as “Free”. 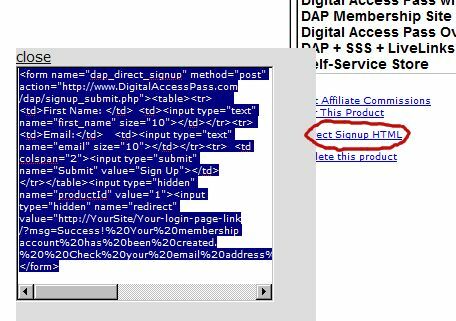 Once you have created a Product in DAP, and have added content (blog post/page links, links to files, etc), and have saved it, on the Product page, below the Product name list, you will see a link called “Direct Signup HTML”. (See image below). You must first select a Product before you can copy the correct form HTML. This HTML gives you the full HTML form code that you can publish on any page of your web site. This form only collects an email address and a first name. Take this HTML code and publish it on page of your web site where you want sign up users. This could be a WP page or post too. Don’t forget to change the text above, where it says “http://YourSite/Your-login-page-link/?…” to point to your actual domain name and to your actual login page (if you have customized it). Then, when someone enters their email address and first name and signs up through the signup form, DAP creates an account for them using that email address, creates a random password, and sends them an email with their email/password. After that, you can drip any content or emails on them that are marked as “Free” (when adding content or emails). At some later point, if they purchase any of your “Paid” products (see the “1. Purchase” section above), then as long as they use the same email id during purchase, DAP will automatically give them access to all of the “Paid” content in the Product that they just purchased. If you wish to directly give someone access to a Product and all its content and emails, you can add them directly from the DAP Admin screen (Users > Add/Edit). You just need their email id and their first name (both of which they can change subsequently) to add them to a Product. While adding them, you have the option of marking them as a “Paid” user by checking the “Mark as Paid” checkbox. If you don’t check this check box, then they will be added as a “Free” user and get access only to “Free” resources (content/emails). But if you check the “Mark as Paid” checkbox, then they will get access to all “Paid” content and emails, just like someone who is actually a “Paid” member. The Configuration data of your DAP installation can be customized online. Click on the “Config” link in the nav bar at the top. You will see a drop-down (showing “Basic” by default). You can modify option by option (“Basic”, “Payment Processing”, etc) or view them all together at one time (“All”). WARNING: Save each modified config field individually. This means, every time you modify one row of config data, hit the “Save” button at the end of that row. You will not be able to change multiple rows and have all of them saved all at once. It has to be saved row by row*. Modify fields like “Site Name”, “Admin Name”, “Admin Email” etc. See more details about the config screen below. This is where you put in the descriptive name for your web site. When sending emails, you may sometimes wish to use a “name” for your site rather than just a domain name. “Welcome to Digital Access Pass”, you can say. This is the “from name” used in outgoing emails. This is the “from email” used in outgoing emails. When set to “Log All Activity”, it logs all kinds of verbose details to the logs, to help during installation and troubleshooting. When set to “Log Errors Only” it logs only major errors and issues. So during installation and setup, set this field to “Log All Activity”. Once everything is up and running and you are ready to launch your site, turn this up to “Log Errors Only”. The first 7 fields on this page are required ONLY if you are going to be using a) 1ShoppingCart.com (incl. private labels) or b) ClickBank. If you are going to be using 1ShoppingCart.com or ClickBank, then read the explanation for the fields below. But Iif you are going to be using Paypal, then you can skip reading the explanation for these 7 fields. So here is the documentation for the Payment Processing tab, which includes the 7 fields. The way DAP integrates with 1ShoppingCart (1SC) and ClickBank (CB) is via Email. Whenever someone makes a purchase through 1SC or CB, they send you the site owner – what is called a “Payment Notification Email”. This email lets you know that someone just purchased one of your products, and contains the buyer information like name, email address, mailing address, etc. We call this the email id at which you receive these payment notification emails – as the “Billing Email”. So all you need to do to set up integration between DAP and 1SC/CB, is to tell DAP what this billing email id is, and how to access it, so that DAP can log in to this email, look at all the payment notification emails, pick out the ones you want it to process, automatically create an account for your member on your membership site, and send them an email notifying them how to log in to their account on your membership site and access the product that they just purchased from you. 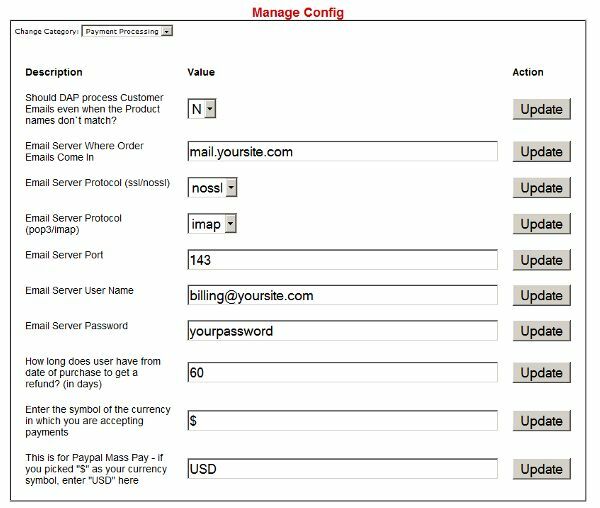 Now, you may have multiple web sites with multiple products, and you may be receiving payment notifications for many web sites at one single “Billing Email”. But you don’t want to add them all to your membership site, right? You just want to add those who purchase a specific product, to your membership site. So this field is where you tell DAP whether it should add ALL buyers to your membership site, or just those who purchased a specific product. By default, this is set to “N”, which means, DAP will ONLY process emails where the Product name you created in DAP exactly matches the Product name in the billing email. If you still don’t understand this, watch the videos, and just leave this at the default “N” for now until you understand more. This usually looks like “mail.yoursite.com”. You can find this info in your web host control panel, on the “Emails” tab, where you would normally create new email ids for your web site. 3. “Email Server Protocol (ssl/nossl)”: Leave this at the default, which is “nossl”. 4. “Email Server Protocol (pop3/imap)”: Leave this at the default, “imap”. 5. “Email Server Port”: Leave this at the default, “143”. This is the actual billing email id. Ex: billing@yoursite.com or whatever email id it is where you get the Payment Notification Emails from 1SC/CB. This is the password to check that email id. The following fields apply to everyone, not just to users of 1SC/CB. “60” is recommended and is the default. But you can change this to any number you want. Default is “$”. If you are going to be using any other currency, then enter the symbol here. If you are going to be paying your affiliates in US dollars, and picked the “$” in field #9 above, then enter USD here. 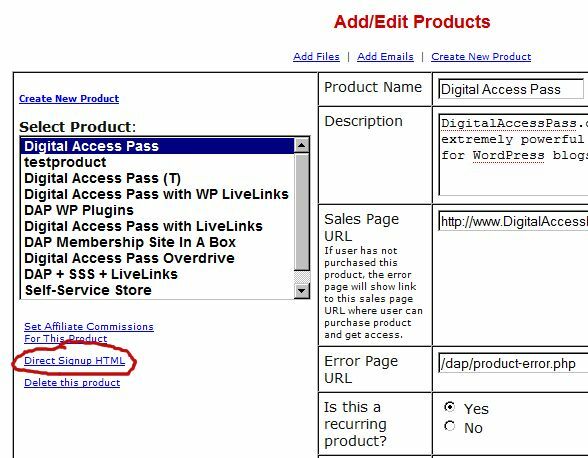 If you are in a mom-and-pop, or non Internet Marketing Niche, where you dont want to confuse users by displaying the affiliate section on the default user home page, then set this to “N”. All users will be signed up as affiliates by default they just wont see their affiliate link and affiliate stats on their user home page. This is a security feature. This is where you restrict the number of different IPs that a user can log in to their account on your membership site. This is to prevent password sharing, so if you see the email id being used to log in from more IPs than the above limit, then DAP will automatically lock their account, and send them and you an email notifying you both that the account has been locked. You can then either wait for them to contact you by email to get their account unlocked, or if you trust/know the user, you can unlock the account yourself on the “Edit User” screen. Once you unlock the user, both you and the user will get an email notifying you both that the account has been unlocked. You can customize the content of the lock and unlock notification emails on the Templates page. Set to “N” by default. If you want people who have cancelled their account, or unsubscribed from your membership site to have access to content that they had access previously, then set this to “Y”. NOTE: If you set this to “Y”, then remember this: Say you are offering a free 1 month trial. And you are giving them access to a few videos or blog posts, then even if they cancel their free trial, then they will continue to have access to the 1st months content. If you had set this to “N”, then at the end of the 1st month, if they cancel their trial, then they wont be able to access 1st months content. Thats the difference. This is for advanced users only, if you are planning to use Aweber, and want every new member who signs up for a membership in DAP, to also be automatically added to your Aweber account. This requires some advanced set up, which is explained at http://www.digitalaccesspass.com/doc/aweber-integration/ . This is not something you should be looking to set up when youre first trying to set up DAP. This is a power-user feature, and you should get back to this towards the end of your membership setup, rather than at the beginning. This is for those who have purchased the “Self-Service Store” (SSS) plugin only. If you dont have this, then skip ahead to the next one. If you have purchased SSS, then set this to “Y” to enable your Self-Service Store where users can cash in their credits and buy the products they want for this month, rather than you (as the site owner) deciding what content they get this month. Again, this is for those who have purchased the “Self-Service Store” (SSS) plugin only. If you dont have this, then skip ahead to the next one. This setting allows you to control how the products in your SSS are displayed Most popular first, Ascending order by name, etc. Instead of sending them to this page, you can put the login form on a “WordPress Page” within your own blog, so that the look and feel is always the same, and your member never has to leave the familiar look and feel of your blog just to login. You can change this to whatever URL you want (just leave out the domain name from the link). With this turned off (set to “N” by default), when someone visits your blog, they will ONLY see posts that they are “eligible” to view. This applies to your blogs main page as well as individual posts. For instance, if you have 100 posts, and have protected 95 of them, then on your blogs home page, your casual visitor will see only 5 blog posts in TOTAL. They wont even see the titles or bodies of the protected posts until they become a member. If set to “Y” (Show snippets even of protected blog posts), then your users will see content from each blog post of even protected posts, but only up to the “More” button. Clicking on the “More” link would then ask them to login first before they can access the remainder of the content. So when Googles spider (or your visitor) arrives at your blog after you publish a new post, it/they will see a summary of the post, instead of being redirected to a login page. This is extremely powerful from an SEO perspective. By default, “Double Optin” is set to “Y”. It means, when your member first joins your membership site (she doesnt have an account so far), then only the very first time when an account is being created using her email address, then an “Activation Email” (customize on Templates page) with an activation link is sent to your member. They have to click on the activation link to set their account status to “Active”. This process also records their IP address, in case you need them for as “Anti Spam” proof. But if you set this to “N”, then whenever their account is first created, their account is directly activated by DAP, and no activation link is required to be clicked, and no activation email is sent to your member.